New customers in Nigeria who register with the 22Bet promo code are entitled to a welcome bonus. The offer is a 100% matched bonus up to N50,000 based on the value of the initial deposit. New customers also receive 22Bet Points and there is a casino offer that gives customers up to N130,000 in the form of bonus money and 22Bet Points. The registration process begins when potential new customers click the button that appears below this guide. 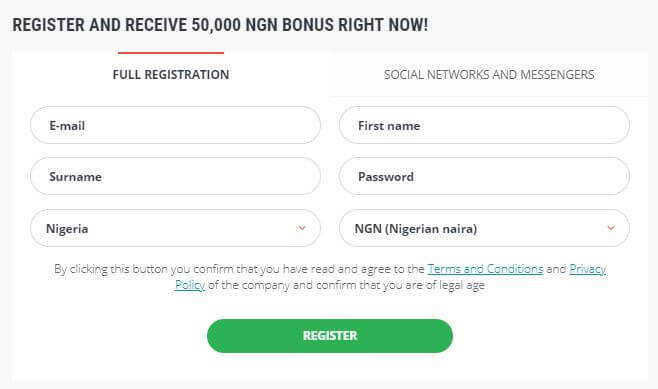 Complete the registration process which involves entering personal details and a unique combination of a Username and Password. The 22Bet promo code will be entered by default so there is no need to populate this field. Click the ‘REGISTER’ button to accept the Terms & Conditions and create a new account. New customers then select which bonus to activate for the Sportsbook or Casino. The qualifying deposit is made for the Sportsbook or casino and the bonus money will be immediately credited into the account. New customers located in Nigeria are eligible but the offer does not apply to existing customers. An initial deposit is required to activate the bonus. New customers must select the 22Bet promo code offer: Sportsbook or casino. The bonus is up to N50,000 depending on the deposit. The bonus amount must be staked five times on accumulators before customers have access to the funds. Qualifying bets must contain at least three selections at odds of 1.40 or bigger. The bonus funds will expire after 7 days. New customers in Nigeria only. 100% matched deposit bonus up to N130,000. Wagering requirement of 50 times the bonus. The Casino bonus cannot be claimed if the Sportsbook bonus has been activated. The 22Bet promo code bonus for casino players is transparent and achievable. 22Bet sports betting offers odds on over 20 sports, in addition to entertainment, politics and specials. Customers can select favourites which appear above the list of sports. The most popular leagues and competitions are displayed prominently and most of these are related to football which is the most popular betting sport in Nigeria. The other featured leagues are related to tennis, basketball and ice hockey. No other online bookmaker offers as many markets for one event. 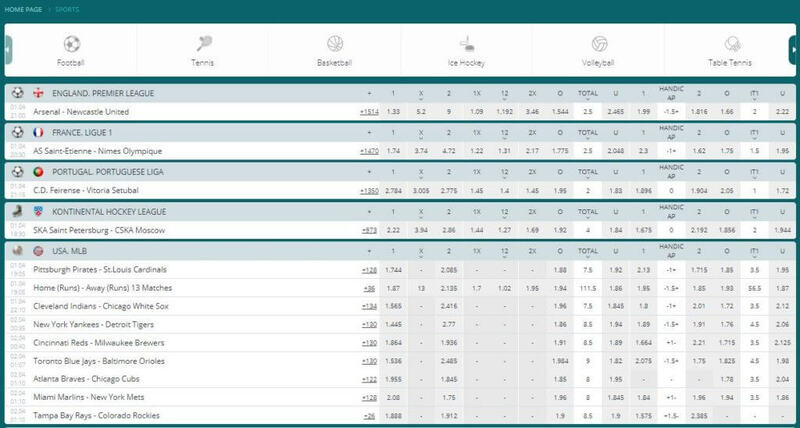 22Bet offers a similar range of markets for events in tennis, basketball, ice hockey and other sports. The odds margin for the football three-way markets is 3% which is much lower than average. The operator competes on the value in the odds across the range of sports. Customers in Nigeria can place in-play bets for many sports but the most popular are football, tennis and basketball. At the time of writing, customers do not have access to live streaming. However, the in-play interface provides the current score and live statistics. A graphic shows the team in possession for a football match. Betting is canceled in case a crucial even like a goal or penalty. For any football fixture, customers can bet on up to 100 in-play markets including the match result, next team to score, number of goals and handicaps. Betting margins compare favourably with other operators. 22Bet has a mobile app for iOS and Android devices which can be downloaded directly from the brand’s website. Just remember to follow specific instructions for iOS and Android devices. The app sends notifications to bettors when a bet has expired and the result is known. Customers can also bet on mobile devices using a browser. Customers login from the mobile browser and have a fully functional service that replicates the desktop version of the site. The 22Bet app allows customers to place bets in pre-match and in-play markets using mobile devices. Customers with 22Bet can make payments using debit and credit cards, e-Wallets such as Skrill and Neteller and Bank Transfer. 22Bet accepts a number of cryptocurrencies which is controversial because these currencies don’t have a good reputation for reliability and sustainability. Deposits are immediate and free of charge but withdrawals take from 3 to 7 days depending on the method. Deposits and withdrawals are subject to minimum and maximum amounts which are in line with industry standards. Customers with 22Bet can contact the support team using a generic email address. Response times can be up to 24 hours but longer depending on the number of inquiries. The site also features a comprehensive Frequently Asked Questions facility which covers the betting and account functions. At the time of writing, there was no live chat facility but this could be added in the future. There is no telephone and postal address support for customers located in Nigeria. 22Bet encourages responsible gambling for their customers. 22Bet provides customers in Nigeria with a positive betting experience. The sportsbook offers odds on a wide range of leagues and matches. Bets can be placed in pre-match and in-play markets across over 20 sports. The welcome offer is transparent and achievable. The introduction of live streaming and Live Chat would take the site to a new level for an operator based in Nigeria. Payment options and customer service are satisfactory and the mobile app is easy to use and navigate. The Sportsbook and Casino are available on one platform and funds can be used from the same account. Yes, the 22Bet promo code activates the welcome bonus. Who can claim the 22Bet promo code offer? New customers from Nigeria can claim the 22Bet promo code offer. Already existing customers can focus on other bonuses offered by the brand. There is no mobile specific bonus available. However, new customers can claim a regular bonus by using mobile devices. The 22Bet promo code bonus is not available with other promotions. Ensure the correct procedure is being followed or contact Customer Services.